RadPivotGrid comes equipped with powerful filtering mechanism that supports three modes: report, label and value. Report filters are applied on fields that do not participate in the grouping of the data but are still present in the underlying data source. So, for example, if the data items grouped by RadPivotGrid feature a Category property with 100 unique values and the data should be grouped only by those items that fall within only a limited set of Categories (let’s say Books, Music, Video) but exclude Category from the properties the grid is being grouped by, then you should apply a report filter on the Category field. In practice, report filters allow the exclusion of selected field items from the data prior to its grouping. In order for a pivot grid field to become eligible for report filtering it should be added to RadPivotGrid’s fields collection as a PivotGridReportField. That will effectively make it part of the grid’s filter zone and make report filtering applicable to it. Filtering in RadPivotGrid is switched on/off by the AllowFiltering property. When turned on it will make RadPivotGrid display a tiny filter image beside each field’s name. This is the fields filter button which opens up the filter window. The latter allows the user to exclude data items based on unique key values or apply a wide range of filter operators that fall within two categories: Label and Valuefilters. 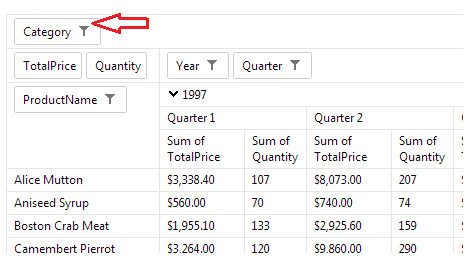 Label filters control which groups for a given field will remain in the pivot data view after grouping has been performed. 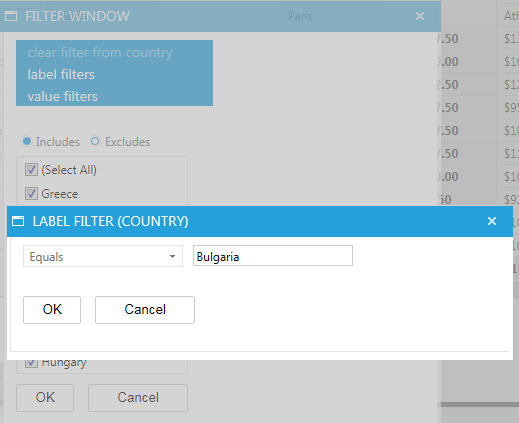 If, for example, you have your data grouped by a Country field and you need only those Country groups of items that relate to Bulgaria you should apply an Equals label filter to the Country field with the respective string filter value of “Bulgaria”. Label filters are certainly applicable to both RadPivotGrid’s row and value fields. Value filters, for their part, allow filtering operations to be performed on the aggregate results. Again, the filtering is applied after the grouping of the data. 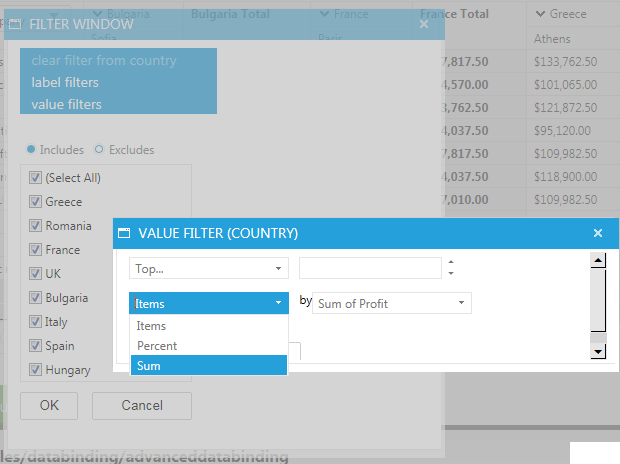 Here is another example: Suppose you have grouped your data by Country,aggregated it by Sum of Cost and need only those Country groups of items which cumulative cost falls within a certain range. 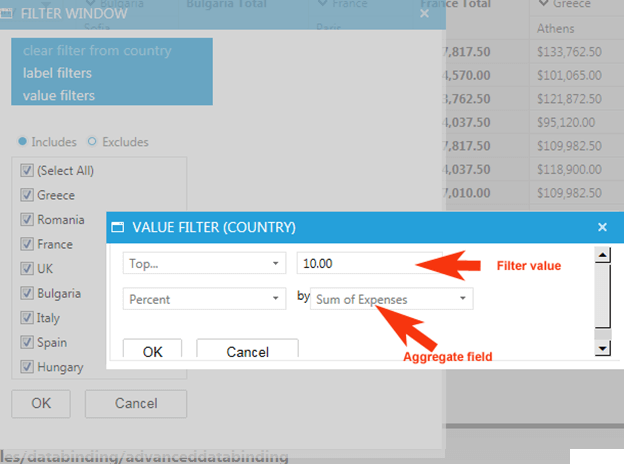 Then you should apply a Between value filter on the Country field with the corresponding filter values. 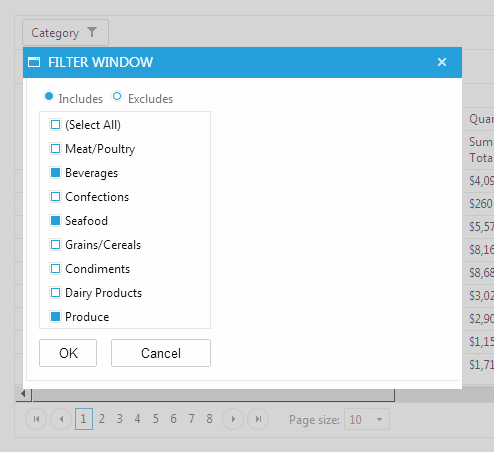 Value filters too are applicable to both RadPivotGrid’s row and value fields. Whereas most filter operators are self-explanatory, the Top and Bottom ones might not be that obvious. Those operators allow three modes: Items, Percent and Sum. They also expect and aggregate field and a filter value as part of the overall filter condition. You can set the initial filter for a RadPivotGrid control so that when the Web page is first loaded, it presents an already-filtered set of data. You can filter by label and by value on the server by using FilterByLabel and FilterByValue methods. RadPivotGrid’s filtering UI consists of two dialogues. The one that opens first upon clicking a given field’s filter button allows the construction of set, label and value filters. 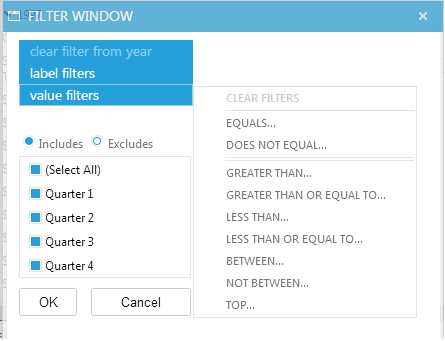 If, however, a Top value filter is selected and extra filter dialogue is opened to take in additional parameters that are mandatory for the filter expression and have been explained above in Special filter functions.